For quite a while now I've been wanting to mix up some of my own drink syrups (especially after reaping the rewards of the Cardamom Lemongrass Syrup I made for the Pod Thai). So when my college roommate, Tamar, who's an herbal mixologist & blogger over at TamThyme, asked me if I wanted to do a collaboration to mix up some Orgeat, it was a no brainer! For those of you who haven't heard of Orgeat (pronounced or-zhat or or-zha depending on who you talk to), it's a sweet, almond syrup (basically liquid marzipan) commonly used in popular tiki drinks like the Mai Tai. There are a ton of different ways to make your own Orgeat out there so, for this run, I kind of took a mix of a few recipes to come up with one of my own. Wondering where Tamar's skills came in? She decided to create her own Orange Flower Water and Rose Water, which are key ingredients in Orgeat recipes. Tamar used her Alembic Still to make some hydrosols (or infused waters) of her own. I have to admit, this whole setup looked a bit like a crazy chemistry experiment but it yielded delicious results! Interested in her process? You can read all about her homemade floral waters here! For our Orgeat, we used her creations instead of a pre-bottled option, like the one pictured below (which, for simplicity's sake, is still a great option when making your own Orgeat). In the end, our homemade Orgeat tasted way better (and, might we say, less toxic?) than the store-bought option we had on hand to compare against. We didn't have a chance to compare it to the more expensive pre-bottled options out there; regardless, it was pretty tasty! Since this recipe was fairly easy & affordable to make, we're definitely going to be mixing up our own from now on! We might even experiment with other methods in the future. To make your own Orgeat, follow our recipe below! 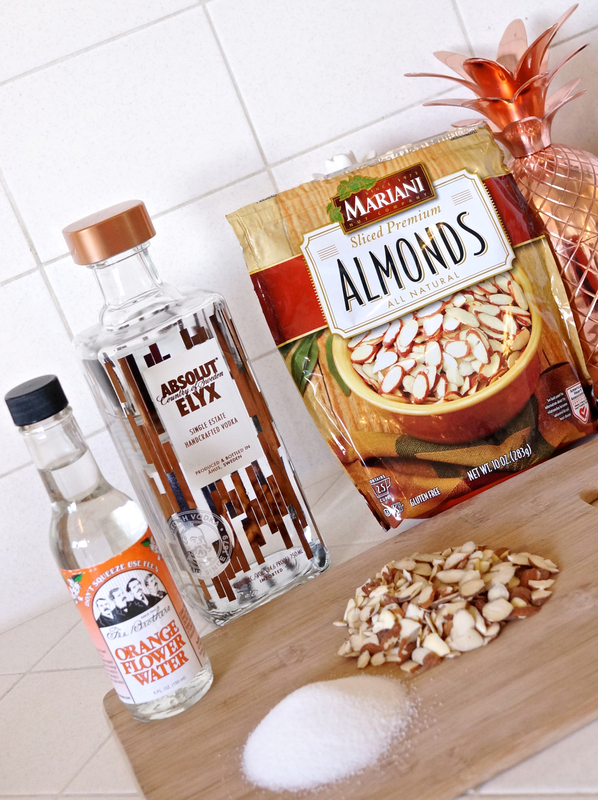 Pulverize the almonds in a blender until they're slightly larger than breadcrumbs. This took a quick pulse or two in the good ol' NutriBullet. In a saucepan, warm up sugar and water over medium heat until the sugar dissolves and the water boils (about three minutes) while stirring constantly. Add almonds and simmer on low until the mixture is about to boil. Remove from heat and cover for 3-10 hours. Stir occasionally throughout that time period. We found that letting the mixture sit for about 6 hours was ideal while leaving it for 10+ hours made the mixture more bitter than we would have liked. Over a bowl, strain/squeeze the almond mixture through a few layers of cheesecloth with a mesh strainer below. It's worth wearing rubber gloves for this step if you don't want your hands getting super sticky in the process. Stir in the Orange Flower Water or Rose Water and the Brandy or Vodka. Pour into an airtight container (mason jars work well) and refrigerate. Your homemade Orgeat should last for about 3 months. 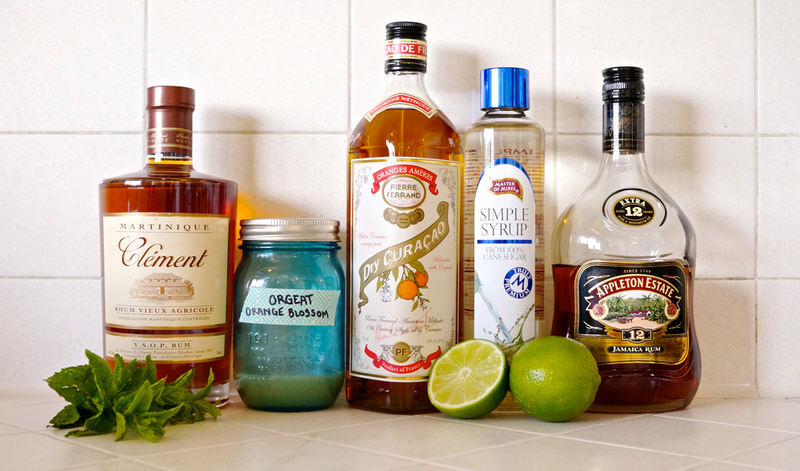 Mix up your favorite tiki drink recipe that calls for Orgeat! We created some great tasting Mai Tai's based on Jeff "Beachbum" Berry's recipe! Anyone else out there make their own Orgeat? We'd be interested to hear what methods you use!